Sometimes, nail art inspiration can come from the weirdest of places. I have mentioned here before that I love cartoons. 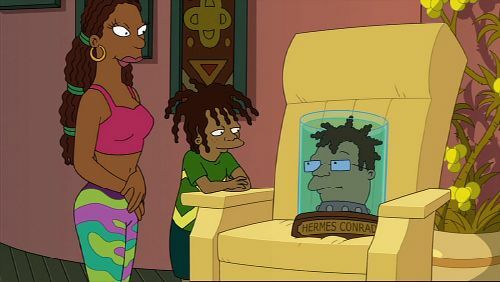 Along with Adventure Time, Futurama is one of my favorite animated shows. I was idly watching a few episodes the other afternoon and saw this awesome pattern that was just screaming to be turned into nail art! I'd ask if you can guess where it's from but I'm afraid I've already revealed it in the post title. The pattern was on LaBarbara Conrad's (Hermes' wife) pants! Here is the best shot I could find of the pants. I didn't get the colors quite dead-on, but I really love the way these look together nonetheless. I used American Apparel Malibu Green, American Apparel Crescent Heights, and Lime Crime Lavendairy painted freehand over one coat of Cult Nails Tempest (a white creme). This flowy, wavelike camo pattern was a lot of fun to paint and not too difficult! I think I'll be trying this again in the future in different color combinations. Have you ever been inspired by something unusual like this? How do you think I did replicating the pattern? My hubs and I love Futurama!! I always hear her name in my head the way Hermes says it..all Jamaican like. We watch a lot of Adventure Time, Avatar and Legend of Korra. We are almost 30 and love love cartoons. Great job on the pattern. They look great!! Woohoo! My boyfriend and I love Avatar and Korra too! Love it - very impressive! Gorgeous!!! I love it so much and I'm definitely keeping it in my "gotta try" drawer!!! Hilarious that we have the same taste in cartoons lol! Love the nail art! I love seeing nail art inspired by things like this! Just yesterday I was inspired by a pattern on the shower towel :)). Great realization! I hope one day I could freehand pictures on my nails like you do :)). haha i love the inspiration! this is so cool! You did a great job! Awesome!